The worst financial depression NSW has faced was not in the 1930s, but rather four decades earlier in the 1890s. The 1890s depression was characterised by a severe financial crisis that saw more than half the various trading banks suspend payments and many non-bank insitutions fail. By comparion only a few small insitutions failed in the 1930s. Likewise unemployment is assumed to have been even worse in the 1890s financial meltdown. In this climate, any hope of serious private investment in mining disappeared and the government looked to encourage the unemployed to get out of the towns and cities and into gold prospecting. This Board was formed to assist the Government Labour Bureau with advice in drafting the unemployed of Sydney to suitable localities within the Colony where it was considered they had a chance of earning a living by fossicking on the old gold-fields. The men were supplied with a railway ticket to the station nearest their destination, and a miner’s right, on credit; and it is fair to state that a fair percentage of the men have seen their way to refund the cost of such to the Government. It is also an indication that the men appreciate the assistance rendered, and the fact that many of them removed their families to the gold-fields would seem to show that they have improved their positions by proceeding there. The number of men recommended for passes in 1891, was 9,572, and from 1st January to 30th June, 1895,4,081. The decided increase in the yield of gold within this Colony during the past four years is no doubt partly due to the work of this large body of men throughout the Colony, who, from all reports received, were able to at least earn rations, and some of the more industrious, good wages. Many of the men whom circumstances compelled to apply for a miner’s right on credit wore able to renew their rights at the beginning of 1895 at their own cost. 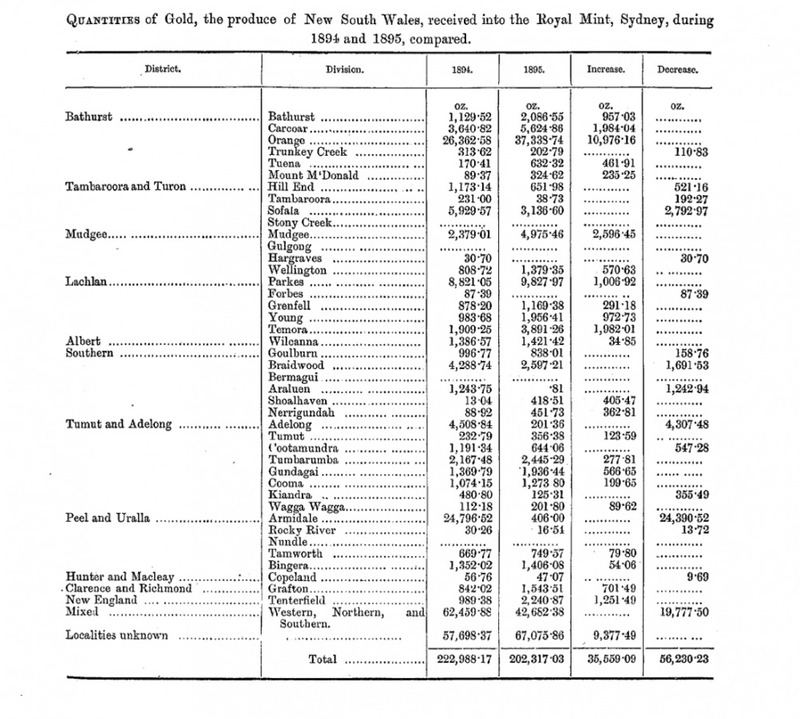 The output of gold from the opening of our gold-fields to the end of 1895 amounts to 11,394,562 oz., valued at £42,326,588 38. Od. For the year just past the output was 360,165 oz., valued at £1,3] 5,929 5s. 4d., an increase of £ 1.59,211 17s. 9d. over 1894. Without a doubt ·this gratifying .result is in a measure due to the large number of unemployed men sent to the gold-fields as fossickers, as the marked increase dates from the inauguration of that scheme. Although the earnings of these men were much restricted by the exceptional drought experienced throughout the Colony during the year, the increased yields from the Lucknow and HiI1grove mines did much to mal,e up the decrease from this cause. 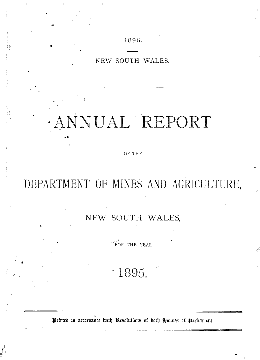 There is erery rfason to believe that the yields from these fields will be maintained, and in face of the prospects of a large increase in the yield fl’om the W yalong, Pambula, and Bulgandra Gold-fields, a very much larger output of gold may be confidently expected during 1896. Cowra Diri.lion. This Division is rapidly improving its position as a gold-producing district, the returns being 1,810 oz. as compared with 802 oz. in 1894. The recent discoveries on private property at Binni Creek are responsible for the increase, and as prospecting work is beiug rapidly carried forward further satisfactory developments may be looked forward to. Good work is being done at Scrubby Rush, where some very promising reefs have been opened out, one of the leases being floated for a large sum. A little gold is being got on Crown lands by a number of fossickers, but the principal operations are being carried out on priyate land. A small rush took place during the year to ‘Voodstock, where some good·lookillg stone had been struck, but nothing worthy of special notice carne of it. jJfount M’Donalcl Division. Mining operations in this Division have been extremely ,dull during the past yeai’ as will be shown by the returns, the quantity of gold won being 421 oz. as compared with 996 oz. in 1894. The Balmoral Company is still carrying on prospecting work, and intend to thoroughly test their property. :’leveral other parties are at work in the Division, and it is expected that some important developments will be reported before Ion”’. The work of the fossicker in the district has been greatly retarded owing to the scarcity of water, but so far they hiweobeen able to procure snfficient gold to keep them in rations. There is a very large decrease in the output of gold from this distrint, as compared with pre;ious years, the total valne beinS” £4,356, a rednction of £3,243 on the yield for 1894. The decrease in the yield can, however, be satisfactorily explained by the f!Lct that the whole of the mines at Galley Swamp have been taken over by the Anglo-Australian Exploration Oompany (Limited) of London, who for the last six months of the year, have been devoting their sole attention to the sinking of shafts, the erection of machinery and other development-work. The machinery being erected embraces all the latest improvements and gold-saving appliances. A very large increase in the yield for 1896 may be anticipated. Woodward arId Party put through 70 tons for 326 oz., and Smith and Son 47 tons for 151 oz. Very little work has been done at Burnt Yard during the year, but a good deal of prospecting work is being carried on at Flyer’s Creek and Slattery’s Creek, the principal company at work being The Slattery’s Creek Gold-mining Oompany. A few men are still at work in the alluvial with varying success. There are 162 men at work on ~the-alluvial ground in this division, and the yield of gold was ,612 oz., vulued at £2,285, as compared with 2,333 oz. won in 1894. The large decrease is principally due to the extremely dry season which prevented work being successively carried on in the alluvial claims, and retarded the work of the fossickers in the creeks and gullies. The Compagnie des Mines D’Or, at Brown’s Creek, employ 120 men, and dnring the year have expended a large snm in the erection of works and machinery for treating their lode-stuff on a large scale. The operations of the company are expected to largely swell the returns from this Division during 1896. Several parties are still at work at King’s Plain with promising indications of success. Newbridge Division. There is a very gratifying increase in the yield of gold from this Division, viz., 811 oz., as compared with 150 oz. in 1894, a large proportion of the gold being got from land thrown open under the provisions of the Mining on Private Lands Act, 1894_ Prospecting work is being vigorously carried on at Caloola Creek and at the Sugar Loaf, wher” several parties are being assisted from the Prospecting Vote to further test their claims. A considerable number of men still manage to earn rations by fossicking in the district. This Division also shows a satisfactory increase, the yield being 2,340 07.. as compared with ],423 oz. in 1894. There were 250 men employed in gold-mining throughout the Division during the past year, and all have been able to make a living, while some of them have done very well. The continued dry weather prevented sluiciug all the year round, otherwise the yield would have been greatly increased. As an instance of the severity of the drought, it is stated that the Mulgunnia Creek has not been running since October, 1894_ At Colo Creek, Messrs. Clarth and Company have erected a 30-head battery, and a 12-head battery has heen started to work near the Alma Dam. Messrs. Crees and Party erected a 9-head battery on Wilson’s Reef to treat the mullock. which is plentiful in that locality, but were prevented from starting owing to the want of water_ The Bathurst Mines Company (Ltd.) is also erecting a new battery on its property. Mount Gray was re-started during the year, but is again idle, as the machinery failed to treat the stone profitably. A Melbourne syndicate have taken up 35 acres of the old workings at Pine Ridge, Dncl intend giving the place a thorough trial. Se,·eral parties are in receipt of prospecting aiel in the Division, but so far have not succeeded striking anything payable. ‘l’uena Divi,.ion. The yield of gold ‘from this ‘Division during the year was valued at £6,495 as compared with £5,777 the previous year. There has been a very evident revival in alluvial mining throughout this District, and at the present time about 360 men are employed in the work. The Amos Gold-mining Company which is in receipt of aid from the Prospecting Vote, struck some very rich stone in its claim, one small parcel of ahout 5 tons yielding 150 oz. of gold. The Dyke Company crushed 150 tons for 8 dwt. per ton, and as the stuff can be got cheaply and is easy to treat, it should pay well with suitable machinery. M’Vicar and party put through 30 tons for I! oz. per ton, aml Brennan and Party had a trial crUShing which gave a return of 1 oz. pel’ ton. At Junction Point, Martin and Party put through 200 tons which yielded nearly 2 oz. per ton. It is expected that a large number of men will be at work in this Division during 1896. The yield from this Division is a little more than double that of 1894, being 1,540 oz. as compared with 750 oz. the previous year-the bulk of the gold being won from alluvial ground. The depression existing throughout the district compelled a number of men to turn their attention to mining, with the result that the old alluvial workings in the district have been fossicked over again, in some instance excellent returns being obtained. One party on Stoney Creek, working on a point that has been occasionally worked for over thirty years, averaged £10 per week for over three months. Rutherford and Party working a reef at Gilmandyke on private lands put 200 tons through their own battery for a yield of 227 oz. valued at £883 8s. 2d. \Vork at Mount Maud is in abeyance pending settlement of the prospector’s, David Croziers, title to the land. A trial crushing of several tons of stoue from the reef went over 6 oz. to the ton. On Church and School land at Caloola Creek three parties are at work on a sedimentary slate lode. They have erected a Huntingdon mill and have put through 1,300 tons for a yield of 214 oz. of gold. About twenty parties are working in this Division under section 33 of the Mining on Private Lands Act, some of whom are doing very well, others just making a living. Burmga Division. About 265 oz. was the yield from this Division, as compared with ]85 oz. in ]894; but this return is likely to he largely increased in 1896. The Burraga Gold’miniJ1g Company which has been at work putting in a tunnel about 1 mile east of Mr. Lloyd’s Copper-mine, have at last struck the reef, which is 10 ft. wide. A parcel of stone from it sent to the Clyde \Vorks for treatment yielded half an ounce of free gola per ton. The company has erected a lO-head battery but unfortunately have not been able to start through the scarcity of water. M’Vicar, Phillips’ and Party, working on the Isabella River, are sinking on a very promising reef, assays from which have gone as high as 4 oz. per ton. The reef is now 2 feet wide and appears to improve as it goes down. A large number of men are fossicking in the district, but it is questionable if they earn more than rations, the dry weather having retarded work very much. Tate and Lawler have a gold-saving machine at work on Mount Werong, and are said to be doing fairly well, the machine treats about eighty loads per day but could put through more with a plentiful supply of water. The only mining work carried on in this Division is by a few fossickers who won during the year 130 oz. valued at £390 which barely keeps them in rations. Oberon Division. The value of the gold won in tbis Division during the year was £1,450, an increase of £150 on the previous year. One of the old reefs has been taken np, and a small plant erected, and as parties have commenced work on nearly every available site, the locality is now in a fair way to be thorouQ;hly tested. There are still a few fossickers working in the locality, some of whom appear to be doing fairly well. This Division shows a slight increase in the yield of gold o\’er the previous year, the value being £4,617 as compared with 4,540 in 1894. This return would undoubtedly have been much larger had the season been a wet one. There is a good deal of prospecting work going on in the direction of Peel, where soveral very promising reefs are being tested at a depth. It is estimated that 425 Europeans, anel sixty Chinese, were engaged in mining work in this district at the end of the year. James Dewar, “’ho is receiving aid to sink on the Bald Hills, struck wash in the drive 2 feet thick, carrying filJC colours of gold. Another shaft is being pnt down to test the deep ground. lVyagdon Division. There were 215 oz. of alluvial gold won in this DiYision during 1895, a slight increase over the previous year. Bel and l\l’Lennan are being ~ided from the Prospecting Vote to test their claim on the high hill lying between vVya/!don and the Limekiln Road, and Thomas Brett to further test the “Black Monkey” r’eef situated about 2 miles west of the Limeki”n Public School. A number of fossickers are still at work in the locality, with Yarying success. There are 228 gold-miners working in this Di”ision, and they won among them 3,645 oz. of the precious metal, an increase of 1,479 oz. on the previous year. The” Paddy Lackey” is still the principal gold-producing mine in this district, and employs from twenty to thirty men all the year round. A number of parties are working in this Division under aid from the Prospecting Vote, and some important developments are expected from this expenditure. When a sufficient supply of water is available, the men working in the creeks and gullies do fairly well. Hm·tley Division. A few parties are stH! prospecting on Cox’s River, who obtain very fair prospects; but nothing really payable has beeu Orange D~vision. This Division now ranks as the largest gold-producing centre in New South Wales, the value of the gold won. during the past year aggregating £292,229, as compared with £128,197 in 1894. The Wentworth Proprietary Company, at Lucknow, is responsible for the large increase in the returns, as it put through 9,381 tons of stone for a yield of 58,100 oz., valued at £203,350. This company employs over 300 men, and, has erected plant. on its property to the value of £50,000. Good stone is now being raised from the 800-ft. level. The Alladin’s Lamp Gold-mining Company has also extended its operations during the year, and put through 3,889 tons for 23,078 oz., valued at £80,773. This company employs 100 men, and is working at the 700-ft. level. The Amana Company did very little work during the year, and has now ceased work. Derrett and party have put’ in a tunnel for a distance of 200 feet on Carroll’s private land, and have very promising indications of obtaining payable gold. The D’Arcy Estate Gold-mining Company is still pushing forward prospecting operations, and employs twenty-five men on the work. At the Forest Reefs a little prospecting work has been carried on during the year, with varying success. The Ballarat Boring Company, which has obtained the use of a Government diamond-drill, is about to test the deep leads, and little other prospecting work will be done in this locality till the result of the boring is known. At Cadia some prospecting has been done in quartz and alluvial without any important results. In the neighhourhood of Byng a great deal of prospecting work has been done by the Witney Green Gold.mining Company, and the crushing it put through of 164 tons yielded 525 oz. 19 dwt. of gold, valued at £1,868 15s. 4d. The scarcity of water seriously interfered with mining operations at Lewis Ponds during last year; but, nevertheless, the alluvial miners were able to make rations. A 6-head battery has been put up, and there are several reefs it is thought will pay to work with this crushing facility. About forty men are working at Summer-hill Creek, and good-looking stone is being got at about 60 feet. Prospecting work is still being carried on on the BIatchington Estate in search of the lode being worked at Lucknow. Very promising indications are reported to have been met with. THE MUD GEE MINING DISTRICT. Cobbora Divi.sion. There are about 300 alluvial miners working in this Division, principally in the Tucklan district, 13 miles from Cobbora, and the returns state that they won 333 oz. of gold, valued at £1,244. It is doubted, however, whether these figures represent all the gold got, as it is very difficult to obtain correct returns. Payable gold was first reported by Steinberg amI party, who were working ncar Ford’s Creek, under aid from the Prospectiug Vote, who, from April to December, washed 200 load~ for 100 oz. of gold. Payable gold was reported by Marshall and party as having been discovered by them at Stringy-bark Point, 35 oz. being washed from six loads of dirt. This discovery was made in November, and by the end of the year there were thirty claims on gold,-the prospects varying from 6 dwt. to 2~ oz. per load, the sinking being from 10 to 30 feet deep. The great drawback on this, as on many of the gold-fields of the Colony, is the want of water, whioh is being retailed for domestic use at 3d. per bucket, none being a,ailable for mining purposes. Should the year 1896 prove more favourable; large r~turns are expected from this locality. Very little mining is being carried on in this Division at the present time, work being confined to the vicinity of Cranky Jack’s Gully, where a few fossickers are obtaining just sufficient gold to keep them in rations. The gold won in this Division during the year amounted to 4,000 oz. of alluvial gold, valued at £15,200, nearly double the quantity won the previous year; the average number of men employed being 650. About the month of July a rush took place to Yamble, where payable gold was discovered ou the private land of Mr. C. M. Lowe. At one time 500 men were on the field, but by the end of the year the number was reduced to about 250, half of whom are getting payable gold in ground varying from 16 to 50 feet in depth. The English Company, under tbe management of Mr. Frame Fletcher, has temporarily suspended work. The following report on the work being done by the Star Lead Gold-mining Syndicate has been supplied by Mr. \V. S. Brice, the manager :-” During the twelve months the Star Lead Gold-mining f:lyndicate has taken charge of the claim known as the No. I Mine, Star Lead, GUlgong. The work has been chiefly prospecting. The shaft required to be sunk to a greater depth, so that the deeper ground could be tested. Twenty-five feet was sunk in very hard pyritous quartz, leaders being cut through as the work progressed. As these leaders were Dut the flow of water became stronger, in some iustances 2,500 gallons per hour being bailed out of the mine. This heavy flow of water exhausted itself down to 2,000 gallons per hour; which is the rate being maintained at the present time. After the shaft being sunk to the required depth, a drive was begun at 195 feet from the surface, and continued in an easterly direction to cut the Star lead, which is known to run almost due north and south. I may here state that the Star lead has been traced from its head down to the present workiugs into deeper gronnd. On account of its great depth, and the quantity of water to contend with, small parties of working miners could not command the necessary appliances to cope with such difficulties. Since the taking over of the mine by the present syndicate ~40 feet has been tunnelled in an easterly direction, and on account of the hard diorite bars being met with the use of explosives had to be resorted to for more than 100 feet. At a distance of 74 feet from the shaft a cross-cut was pnt in in a south-easterly directIon. This drive was continued for 86 feet, the country tunnelled through being very hard. At 60 feet in this direction a pyritous bar was cut through, the country being heavily charged with arsenical pyrites, which, npon examination, showed slight traces of gold. This bar to all appearance was a dyke, 20 feet through, cleanly bedded with a south-easterly dip of 47°. From the lower part of this face strong water was met with, but following the same strata of country as was met with in sinking the shaft to its present depth, our flow of water did not increase, but continued maintaining the flow of ~l,OOO gallons per hour. A drive has been tunnelled nearly in an opposite direction to our south-east drive, aud extending in a north-easterly direction 40 feet, the hard country has not been met with in this drive, only decomposed diorite being cut through .. \Vater comes strongly from overhead, apparently from higher ground. The water, unlike that met with from the southern side of onr workings, holds lime in solutiou, whereas on our southern side the water carries a quantity of iron in solution. Sixty feet has been tunnelled in an upper level, proviug a run of wash which existed in the upper strata; this wash, so far as proved, having an easterly dip, proving beyond doubt the existence of a deeper channel. The wash or gravel being, in some instances, compact and intermixed with cemented sand, caused without doubt by the infiltration of ferric salts held in solution in our southern water_ Ninety (90) feet have also been tunnelled in this upper level to prove the dip of country, and, in some instances, auriferous gravel has been met with carrying fine and, sometimes, coarse gold. But the syndicate, in a irue spirit of prospecting, decided to push on and prove once and for ever the existence of auriferous drifts and gravels in the deep ground of Gulgong. Summary of the year’s work for the year ending December, 1895 :-Distance of tunnelling completed by present syndicate, 456 feet; siuking shaft 25 feet, making a total depth of present shaft 207 feet; average number of men employed, 23.” H argmves Division. There is a very substantial increase in the yield of gold within this Divisiou during the year, the quantity being 3,245 oz., valued at £8,920, a~ compared with 1,100 oz., valued at £4, 125, won the previous year. The principal revival has been in quartz-mining, and the battery owned by Laing and Company has been kept going all the year through, treating 4,600 . tons of stone for 1,470 oz. A battery is about to be erected on the Old Sawyer’s reef, in which a tuunel has been driven in 180 feet by means of aid from the Prospecting Vote, when the reef 18 inches wide was struck, carrying fair gold. This is said to be a good property. Messrs. Scott and Company’s “Lizzie Watson” 5-head battery was working duriug eight months of the year, and put through 300 tons for 175 oz. Mudgee Division. This Division produced gold to the value of £27,353, an increase of about £7,000 on the yield during 1894. The Old Rhobardah Gold-mining Company, near Cudgegong, has restarted work, and the New Peacock Gold-mining Company, near Limestone, is at work with powerful machinery, and good results are anticipated. The usual amount of fossicking has been carried on at Apple Tree Flat, Pipeclay, Limestone, Merrendee, &c., &c., and small patches in various localities have been found payable, but nothing to last. At Slashers’ Flat, about 9 miles from Mudgee, the old workings have afforded rations to ~ n~JI)ber of mlln during the year. There is a satisfactol’yimprovement in the return of gold from this Divisicn, the quantity being 2,400 oz. as compared with 2,000 oz. won in 1894. Mining matters haye improved generally througliout this Division during last year, with every prospect of a continuance, Messrs. LefHey and party have a splendid claim, their last crushings of 230 tons yielded 450 oz. of gold, the stone being raised from the 60·foot level, where the vein is 2 feet wile. Townsend and party have three promising claims at work, from which they have raised 334 tons for 140 oz. This party have erected a 5·head battery, valued at about £800. Several other claims are at work, and a good deal of prospecting work is going on. Very little has been done during the year in allu vial mining, no water being available for sluicing purposes. Peak Hill Division. A scarcity of water has greatly retarded mining operations within this Division during the year, which accounts for the decrease in the quantity of gold won, viz., 8,192 oz. as against 12,231 oz. won during 1894. The Proprietary Company has partially suspended operations, and has let several parts of the mine on tribute. The tributors are said to be doing very well, owing to their careful selection of the are crushed. No attempt has yet been made to treat the pyritous ores which occur in this mine below the 320·foot level on a large scale. There is a great body of this ore available, and could it be treated profitably, employment would be found for a large number of meu. It is stated that the are could be calcined and treated in bulk for l2s. 6d. per ton, which would yield a handsome profit, as the stone is said to carry about ~ oz. of gold per ton. The water from this liline contains a metallic salt which interferes with the amalgamation of the gold. The Crown of Peak Hill Gold·mining Company is down 300 feet in their main shaft, and expect within the next three months to strike the pyritous lode coming from the Great Eastern mine. This mine is also worked by tributors. The Great Eastern Syndicate crushed 735 tons for 654 oz. The gold in this mine occurs in a hard quartzite resembling flint, and the deposit is extensive. vVythes and Mooney crushed 915 tons for 552 oz. of gold. The ore containing the free gold is nearly exhausted in this mine, but there is apparently an inexhaustible quantity of pYl’itous ore, which should pay with economical treatment. \Y ork is still being carried on in the Bobby Burns mine, where shoots of are occur similar to that found in the Proprietary mine, but the yield of gold is low. Very little work is being carried on in alluvial ground, and till a large suppl} of water is available there is no chance of any revival in that direction. At Tomingley five leases have been sold to an English syndicate for £42,000, and the mine will in future be known as the Myall United Gold.mining Company. The prospecting shaft on gold lease 2 was, during the year, sunk through an intrusion of country about 50 feet, when the reef was again picked up, 4 feet wide, with gold evenly distributed through the stone, 78 tons of wbich yielded 228 oz. of smelted gold. An important development has taken place in Cavin and Party’s claim during this year, when a new make of payable ore was found, 8 feet wide, which yielded 260 oz. of gold from 206 tons of stone. The last crushing of 114 (included in the 206 tons) yielded 205 oz. An unusual feature in this lode is the fact that the wider the lode the richer the stone. There is no alluvial mining of any importance being carried on in the Tomingley district at the present time. The returns from this Division show a very gratifying and substantial increase in the yield of gold during the past year, which are as follows :-789 oz. from allul’ium and 7,032 oz. from quartz, valued at £29,723, an increase of £10,339 Oll the value of the gold obtained in 1894. The Mitchell’s Creek Freehold Gold Estate Company at Daviesville is the largest gold producer in this Division, as it treated 9,260n tons for a yield of 6,720 oz., valued at £25,610. This company has a very large and complete plant, which is valued at £20,000, and the average number of men employed by it is 650; and main shaft has now reached the depth of 680 feet from the surface. The alluvial mining being carried on in the Division at the present time, is contined to a number of men fussicking in the Leds of the Macquarie River anu its tributaries, the Ningala and Wunluman Creeks, where men with some experience in the work can make a fair living. THE TAMBARooRA AND TURON MINING DISTRICT. Hill End Division. LACHLAN MINING DISTRICT. Molonq Divisiim. Although a considerable amount of prospecting work is beingcarried on in this Division, nodiscoveryof any public interest has been made. Several permits were granted by the \Yarden to search on private land, but with the exception of a little gold got at Delaney’s Dyke, by Egglestone, and party there were no results. Several parties are working under aid from the Prospecting Vote in this locality, but, so far, have not struck anything payable. The return from this Division is only 50 oz. of gold, valued at £187 lOs. . . Ca1’go Division. There were 246 oz. of gold won in this Division as compared with 150 oz. in 1894. The Ironclad Mine is still shut down, and an attempt is being made to form it into a company. Prospecting work is still being vigorously carried on, and as some of the parties have very promising indications in their claims, next year’s report may be of a more flourishing nature. Cudal Division. There is no report of any gold having been won in this Division during last year. Three parties have been prospecting at Loup Corner all the year around, but were unable to find anything payable, and abandoned the search. Fair prospects are obtainable in many places, but all attempts to trace the source of the gold have failed. Good prospects are also to be found on Kearney’s land, at Paling Yards, and an application for a permit to mine on the land has been lodged with the ‘Yarden. Daniel Cnrry is receiving aid to sink a shaft on Dwyer’s land at Barragan, where the indications are good; but the shaft is not yet bottomed. Canowind’t’a Division. The quantity of gold won in this Division during the year is just about double that of the previous year, being 677 oz., valued at £2,440. The Lady Burdett-Coutts Golcl-mining Company put through a parcel of 149 tons, which yielded 280 oz. of gold. The Red Jacket, the Blue Jacket, and the Perseverance Companies were at work during the year, but did not crush much stone. The majority of the men employed in alluvial mining only work during the winter months, when plenty of water is available. Ji’o1’bes Division. There is little of importance to report iu connection with the gold-mining carried on in this district, and although complete returns could not be obtained, the gold won may be put down as about 300 oz. Some excitement was occasioned about the beginning of October by the discovery by Pennington aud party of some very rich specimens in a lode, which was known in the early days of the field as the” Rise and Shine.” The discovery was made at the 60-ft. level, and a crushing of 4 tons yielded between 4 and 5 oz. per ton. The lode-decomposed granite-is well defined, between slate walls, but has not yet been crossed by the prospectors. It is thought to be between 30 and 40 feet wide. Between thirty and forty men are at work near Strickland’s Reef, and it is stated that one party washed sixty loads for half an ounce to the load. It is the opinion of the miners in the district that a payable lorle will be found in this locality in deep grounrl. Several parties are at work on the Bald Hills, but have been badly hampered in their operations through the scarcity of water. A good many claims are at work in the neighbourhood of the Pinnacles, with fair prospects. A very satisfactory increas~ is shown in the returns from this Division, the gold won amounting to 10,:l72 oz. as compared with 9,725 oz. in 1894, the nnmber of men employed being 574. The principal mine in the district is the Bushman’s Hill Gold-mining Company, which has erected very expensive machinery ane! other works. ‘Yhen the tribnte expired in April last the mine was worked by the company, and the erection of machinery proceeded with. The underground workings of this mine are in an advanced state-I,800 feet of levels being now open, and being worked. The company estimate that 27,000 tons of stone is in sight. The last crushing of 800 tons by this company yielded 1,327 oz. of gold. If the supply of water woul,! allow of the mine being fully worked, 150 men would find constant employment. On the west side of the above company a large area has been secured, to be called” The Bushman’s Freehold,” and leases have also taken up to the north and north-west of the Bushman’s Hill Company. To the north of the land held by the Bushman’s Freehold Syndicate, 40 acres have beeu applied for, with a view to form a company to cut the Bushman’s Reef at a depth of from 1,700 or 1,800 feet from the surface. Still further north, Boyle and party are on a line of reef having the same underlay as the Bushman’s; but it is a rlifferent line of reef. From this claim to the Dayspring all the land is leased, including Crown and private land. The Dayspring is being worked by a syndicate, who have proved the reef to a total depth of 375 fcet, and driven along the course of the lode at the 200-foot level, a distance of about 500 feet. Quail’s mine is let on tribute, but not much work has been done during the year. Hazlehurst’s mine is also worked by tributors, . and the last crushing taken out hy them proves that payable stone still exists in the mine. The tributors of . the Gladstone mine expect to strike payable stone shortly. A party of miners froll) Peak Hill have started work in a systema~ic mauner on the old Caledonian Hill, and intend proving the ground thoroughly. The Koh-i-nor is also let on tribute, and the men seem to be doing well. The men working VVright’s Reef have very promising prospects, anrl their last crushings show great improvement. Many other claims are at work on the Parkes Gold-field at the present time on ground which has been allowed to lie idle for a surprising period, and consequently some important discoveries may confidently be looked for during 1896. The unusual scarcity of water in the district during 1895 greatly retarded the returns of alluvial gold, and in fact, seriously affected quartz-mining. The returns from this Division show that 594 oz. were won as comp~red with 362 ‘lZ. in 1894. The increase in the returns would have been much greater had a sufficient-supply of water been available for treating the large quantity of washdirt at grass. A party of miners from Peak Hill took up an abandoned claim situated 7 miles from Alectown, on the Alectown- Peak Hill Road, and were fortunate,. after very little work, in striking some very rich stone near to the working shaft. They raised 31 tons, 20 tons of which yielded 9 d wt. per ton, the other II tons at the rate of 33 oz. per ton, and there is a quantity of equally rich stone in sight. It is understood that this claim is under offer to a syndicate for £9,000. To show the apathy of miners in this locality at the present time, I might mention that the adjoining ground was left for several weeks notwithstanding the apparent richness of the stone in the locality, and in face of the fact that another claim in the immediate vicinity had just had a crushing of 33 tons which yielded 2 oz. per ton. A good many parties are, however, now at work, and some valuable discoveries are likely to be made during the present year. A large number of fossickers are still working in this Division, but it is difficult to obtain any inform~tion as to the gold won by them. They appear, however, to be making sllfficient to keep them iu rations. G1’el1fdl Division. . The value of the gold won during the year in this Division was £5,292 as against £5,620 in 1894, a slight decrease, which is directly traceable to the scarcity of water for mining purposes, preventing the treatment of over 500 ton’S of stone now at grass. There are undoubted signs of a marked improvement in quartz-miuing in this Division, the number of men employed in that class of golcl-mining being increased from 100 to 170, and fourteen claims which were idle during 1894 are now in full work. The Young O’Brien Mine-owners are still raising good stone, the quantity treated by them during the year being 852 tons for 322 oz. ; the Enterprise tributors, 306 tons for 214 oz. ; the Homeward Bound, 357 tons for 227 oz., and Holton and party, working the Missing Link Claim, 74 tons for 32 oz. A large number of small crushings brought the total quantity of stone treated in the division to 2,024 tons, which yielded 929 oz. of gold. Clapperzouli and party have erected at vYeddin machinery for treating alluvial quartz and sand, but in consequence 01 the scarcity of water have not been able to make a start. About fifty fossickers are now working in the Division evidently making a living if nothing more. The returns from this Division show that 1,994 oz. of alluvial gold were won during the past year but no quartz gold, which is a considerable decrease on 1894. There are still about 200 men employed in alluvial miniug, but there are only a few remaining in M’Kay’s Paddocks. Barwang, or Tont’s Paddocks are entirely deserted, but at Kemp Hill, Hiii, Cunningham Creek, several parties of miners al’e at work and doing fairly well. The quantity of gold won at Garangula may be put down at 4,302 oz., valued at £113,670. At the beginning of the year over 500 men were on the ground, but by the end the number had dwindled down to 250. The alluvial ground at the main camp and Strawstack Paddock are nearly worked out and this is the principal cause of the diminished popnlation, a few men working in Osborne’s Paddock are getting a little alluvial gold, and that plrt of the field is being further prospected. The reefs found in Strawstack Paddock are beinz vigorously prospected, with the result that Adam’s reef seems payable. It varies in thickness from 6 inches to 24 inches, at the 100-foot level it is 22 inches. A considerable quantity of stone taken from the shaft yielded at the rate of 1 oz. 6 dwt. per ton, crushings from Lightland’s claim returned 17 dwt. per ton; from English’s 15 dwt. per ton; Notts’ 1 oz. 3 dwt. per ton, and 235 tons from Manly’s yielded 176 oz. A 5-head battery was started early in the year, but it has now been increased to 10-head. The average yield from the alluvial at Oarangula was a little over 9 dwt. per load. A small portion of the Prospecting Vote was allotted to test some ground near Frogmore, but nothing payable has been met with so far. A little alluvial gold is being got at Bramah, on the Fish River, in small patches. Some alluvial gold is beiug got at shallow depth at Grassey Creek, but, although a lot of prospecting work has been done, it proved nothing of importance. Tout and party prospecting near Galong discovered a reef from which high assays were obtained, and which is now being opened out. The old Marshal Macmahon Reef at Cunningar has been started ao-ain, and the owners anticipate good results. The quantity of alluvial gold won in this Division duriug the year could not he ascertained, but it must be considerable ~s there are a large number of fossickers working in the. district, and they all ap]?ear to be getting a little gold. The quanttty won from quartz was 7,473 oz., va~ued at £28,214, an mcrease of over £20,000 111 the value of the gold won in 1894. New finds of quartz reefs have been made from time to time during the year in the vicinity of Scrub Yards, and a number of pa.rties ahave been aided out of the Prospecting Vote to test their value at a depth. Hall and party have crushed 286 tons for 1,782 oz. 12 dwt. This vein is from 3 to 15 inches in thickness, and has been worked to a depth of about 100 feet, and the reef has been traced fora distance of ovel’ 400 feet along the surface. A IO·head battery has been erected which will start work immediately water is available. In the immediate neighbourhood of ‘femora, an effort has been made to prove the deep alluvial which was found in Parke’s Prospecting Claim and the Golden Gate, and a grant from the Prospecting Vote has been made to assist in the work. Barmedman Division. Gold mining)l~s-practically been at a standstill during the past year in this Division, the total yield being only 117 oz., valued at £447, which is a large decrease on the 1894 yield. During the latter two or three months of the year, however signs of renewed activity were ma.nifested, and some of the old ground taken up. The Fiery Cross Le!1se, which had bee~ cancelled for non· fulfilment of the labour conditions, has been taken up by a party who intend erecting powerfnl pumping machinery, and give the reef a good trial below water level. Kliuk and party are opening up an old reef to the west of the Fiery Cros3, from which they took a trial crushing which yielded 14 oz. of gold. Maschivitz and party have taken over NessI and party’s claim and battery, and are now arranging to give this property a thorough good trial. The reef averages from 5 to 10 feet wide, in slate country, containing fine gold which require3 careful handling to save. About 6 miles north-west of Barmedman, Roberts and party are working a prospecting claim and were successful in striking a reef, 23 tons from which, put through the battery at Barmedman, gave a return of 29 oz. 8 dwt. This locality which is quite untried couutry and something similal’ to that at ‘Vyalong, being fiat and covered with mallee scrub, is attracting some attention, and several pa.rties are now vigorously cal’rying on prospecting operations and have already discovered several very promising veins. A syndicate h!1S been experimenting with a heap of quartz tailings, of which there are about 40,000 tons in the locality, and have met with much success. A small and simple concentrating machine was erected at a cost of about £100, which driven by the crushing engine, enables them to put through from 130 to 150 loads per week. The concentrates which reduce the tn.ilings by about one-sixth, are sent away for treatment, and so far has yielded a fraction over 3 oz. per tOll. giving a clear profit of between £7 and £8 per ton. The whole of the 40,000 tous mentioned are not expe.Jted to give anything like the above return, yet the syndicate are so satisfied with the prospects of their venture that they are proceeding with the erection of another plant capable of treating 300 tons per week. This matter is really one of great public importance, more especially to those quartz-mining centres containing vast heaps of tailings which might be treated profitably and give employment to a large number of men. Ree/ton Division. This new mining Division, established during the year, previously formed part of the Barmedman Division, and its growing importance may be judged from the returns, which were 1,603 oz. of quartz, and 20 oz. of alluvial gold, valued at £5,075. Confidence in the prospects of the field is shown by the fact that several abandoned reefs have been taken up by experienced miners, who are determined to give the ground a thorough triaL In November last a rush took place to Nixon’s conditional purchase, where a good thickness of wash had been discovered by Slattery and party, at a depth of 17 ft., which yielded 7 dwt. per load. The Christmas holidays coming on, little work was done to prove the find. By the end of the year the number of men on the ground had dwindled to fifty, and,it is doubtful whether that number will be again exceeded unless a deeper channel is discoverecl. The wash is angular, and about a quarter of a mile from the quartz reef; but the wash found further away from the reefs is finer, and more water-worn, but does not contain payable gold. Wyalong and Wyalong West Divisions. Thcre were 2,228 oz. of alluvial gold won in this Division during 1895, which is au increase of nearly 300 oz. on the previous year. In the early part of the year a big rush set iu to Spring Creek, where Staines and party had struck it very rich in their claim, where the sinking was 35 feet dcep, the ground dry, and the wash yielding about 10 dwt. pel’ load. Although several other parties are on good wash, the prospectors’ claim is the richest, with a body of wash that will take some time to work out. More recently, a small rush took place to Eastlake’s farm, near \Vombat, where 30 or 40 miners find employment, and average about 3 dwt. to the load. Numerous other small rushes have tended to keep the mining industry in a state of healthy vitality, and combined with the dearth of other employment in the Division, systematic prospecting has been encouraged, which has reaped a reward in the shape of an extra output of gold. Sluicing has been almost at a standstill owing to the small rainfall. Th” South Burrangong Company are still at work, and their shaft is now down 93 feet. It is hopefully anticipated that the. company will reap the reward of their enterprise during the coming year. TUMUT AND ADELONG MINING DISTRICT. Albury Division. A very satisfactory improvement in the quantity of gold won in this Diyision is reported, the figures being 2,322 oz., valued at £8,8GO, as compared with 1,200 oz., valuerl at £4,200, won in 1894. Towards this total the new discovery contributed 949 oz., which was the yield from 1,244 tons of stone. Although this field was discovered in 1894, little work was done until April of last year. By Angust 450 men had arrived on the field, but owing to all the finds being on private property, and the owners insisting on a 10 per cent. royalty, the men left, and by tbe end of the year the number had dwindled to fifty men, leaving over twenty-five claims idle. The field covers an area of nearly 10 square miles, and eight distinct lines of reefs have been proved auriferous, some of them very rich, their thickness varying from 2 to 18 inches. The three principal lines of reefs are the” Lone Hand,” which was floated in Melbourne; the” Goodwood,” and “Show Day.” Several shafts were sunk for alluvial gold, but were all abandoned without anything payable having been struck. The field has the advantage of a running stream, and with such a large area of auriferous country giving such promising indications, substantial returns may confidently be expected in future from this locality. In the vicinity of Albury a little prospecting work is still being carried on, on the Nail Can Ranges. Although nothing very rich has bcen met with, still the indications are sufficiently encouraging to warrant the hope that rich finds may be made in that locality. A few fossickers working in the Division manage to make a bare living. There is very little mining baing carried on this Division. A few men have been employed working the old abandoned quartz reefs on a small scale, but the returns are not very rich. A party is working the Old Sam Claim on The Four·mile Gold-field, but have not been able to bottom their shaft owing to the influx of water. Corowa Division. As far as could be ascertained, the only gold won iu this Division during the year amounted to 50 oz. from quartz and 5 oz. from alluvium. A strong company is being formed to work the deep lead, supposed to cross the Murray River from Victoria. The~e leads are very extensively worked on the Victorian side of the river, and the proving of them at Corowa is a question of the utmost importance to the Colony. Substantial assistance has been granted from the Prospecting Vote to effect this object, and as very promising prospects have been obtained by means of boring, the company are pretty confident of success. The Hillside Gold-miuing Company is also in receipt of Government assistance to prove its ground, in which operations have been begun. There is a large falling off in the quantity of golci won in this Division, the quantity being 3,923 oz., as compared with 6,357 oz. won in 1894. The decrease in the yield is, however, considered only a temporary one, a considerable revival being noticeable about the end of the year. Some of the mines adjacent to the township are in course of being reopened, several of which have been idle for a long time. The Gibraltar mine, lately sold to an English Company, is being worked on an extensive scale. Three shafts are being sunk, and a complete plant of a sljperior character is on its way from Eugland. The Great Victoria United Gold·mining Company holds 17 acres of land, which includes the old Annette and Research claims, which were worked some twelve years, and gold to the value of something like £50,000 taken from them. Since then they have been lying idle until taken over by the Gibraltar Hill Syndicate, who have worked the mine con· tinuously for the past eighteen months. The main shaft is down 1,075 feet, the deepest in New South “Vales, whilst three other shafts have been sunk on the property, yiz., 770, 700, and 400 feet. The present syndicate have put in a drive at the 600-foot level in main shaft, about 420 feet south, and they are now cross· cutting east and west in hopes of striking the reef. During progress of the work, gold-bearing leaders were met with, likewise some pyritous quartz, from which about 150 oz. of gold were obtained from a crushing of 164 tons of stone. Thc Gibraltar Consolidated Gold-mines are still at work, and during the year raised a fair quantity of good stone. About 70 men are employed on the mines. The Adelong Proprietary Company raised 327 tons for 358 oz., and the Lady Mary Company, at the Gap, 757 tons for 541 oz. Sheppard’s alluvial claim, which still maintains its yield, has been sold to the Gibraltar Company, the” water rights” being the valuable property in their eyes. Quite a large number of men are making a living along the old workings of the Adelong Creek, and o~casionally a very fair patch of ground is met with. About 320 men are employed gold-mining fuili~~~~ . auni(agai Division. This Division shows a substantial increase in the quantity of gold won during the year, which was 1,876 oz., as compared with 1,235 oz. in 1894. There is a considerable amount of quartz mining going on in the Division at the present time, but it is questionable if the owners are doing more than paying expenses, with the exception of one at Jones Greek, where some good gold is being got. This mine is 4 illiles Wfst of the town of Gundagai, on private land. A lot of prospecting work has been done during the year on Mount Parnassus, without any discovery being made, and the veins which fed the rich alluvial discovered at its base are yet to be found. The Kimo Ranges are being prospected in many places where rich gold was obtained in the old days, but, so far, without success. The Jackalass alluvial field at SouthGundagai still affords a living for a considerable number of men, but no large finds are reported. This lead is continuous, but very patchy. Numbers of men are making rations by fossicking among the old workings throughout the Division. OootamundTa Division. Little work has been done within this Division during the year, with the exception of prospecting, and no discovery of any importance has been reported. Junee Division. There were £996 worth of gold won in this Division last year-very little in excess of that oMained in 1894. C. Butler and party, working on the” Old Dust Hole,” under aid from the Prospecting Vote, suspended operations during the year, and abandoned the ground. It was then taken as an extended quartz claim by a party of eight men from other fielcls. After sinking about a foot in No. I Bhaft, abandoned by Butler and party, they struck a reef about 3 feet wide, a trial crushing of 4 tons from which yielded 16 oz. of smelted gold. -Several other crushings from the reef have taken place with very satisfactory results. Shares in the claim are now changing hands at a good figure. A party of miners from New Zealand are erecting a cyanide plant for the purpose of treating the large quantity of tailings lying near the mines. Samples sent over to New Zealand and treated yielded gold to the value of about £6 perton. Mining matters have improved in the vicinity of Eurongilly during the year. From a reef struck on Doyle’S Lease, the following crushings have been taken:- 2 tons 8 cwt. yielded ………………………………. ,. … . .. ………………. ….. ‘” 14~ oz. 1 “ 3” “ ………………………………………….. ‘” …………. …… …… 2l “ 3 “ 0 “ “ …………………………………………….. , …………………… 6£ “ Some very good.looking stone, none of which has yet been tested, has been taken from a reef just discovered in King’s Lease. A few miners are at work in the alluvial, but the want of water is retarding their progress. At ‘Vantiool very little is doing in quartz mining at present; but a few men are working the alluvial, and making fair wages. There w~re 105 oz. of alluvial gold won in this Didsion during the year. Although the yield is small, much activity is displayed in prospecting both for quartz and alluvial in this locality, but with little success so far. At BiJIibalula, about 15 miles north of Tumnt, a long line of reef is being prospected, the gronnd being pegged out for several miles. The trial from the reef has not reached expectations; but the reef, being large, would probably pay were a battery erccted on the ground, as there is abundance of wood and water close to the reef. The “Flats” along the Gilmore Creek, supposed to be very rich so long as they were closed against the miner, have proved on trial not payable. It is thought the highest levels of the valley towards Batlow are likely to prove richer. As far as cau be ascertained only 33 oz. of gold were won in this Division during the year. l\Iining matters have been very slack in this Division during the past twelve months. Three qua.rtz claims have been working at intervals at Lower Tarcutta, but, although they are in receipt of Government aid, very little work has been done. There are always a few fossickers on the EIumula and Carabost Creeks, but they manage to make a bare living only. Bat/ow Division. There are 164 European and 10 Chinese alluvial miners in this Division who won among them 930 oz. of gold, valued at £3,565, nearly £1,000 of an increase On the yield for the previous year. As the bulk of the mining is carried on by ground slnicing the dry season had a very serious effect on the yield, many of the claims having applied for, and been granted suspension. No new finds are reported d lHing the year, the principal work being confined. to the old workings, which a few years ago were not considered payable. On the Gilmore Creek an extensive race is being blasted through a hard bar, and sluicing operations will be shrted as soon as water is available. There is a very large dyke formation at the head of Ad.elong Creek which has been worked by hydraulic sluicing for some years. It is understood that a syndicate has been formed to crush the debris which cannot be treated by sluicing. On Bago Creek three races are being put in to sluice the creek fiats, but as the rock is fairly hard progress is slow. Scattered patches of gold are &tiIl fonnd under the basalt in the neighbourhood of Laurel Hill on the Range that divides the tributaries of the Murray and Murrumbidgee Rivers. T1t1nbarwnba Division. Gold to the value of £6,290 was won in this Division during the ye~r, which is a considerable increase 011 1894. The’ Tmnbarumba Sluicing Company are still at work with varying success. The Tumbarmnba Basalt Deep Lead Gold·mining Company has restarted work and has been sllccessful in striking good·looking wash in its western drive. A goorl deal of prospecting work is being carried on, and some very rich specimens are occasionally met with in the qnartz veins at the junction of the dyke and granite country. The usual number of fossickers are met with in this Division, and when water is abundant they appear to do fairly well. Nan’amlera Divi.sion. The returns show that 9640 oz. of qilartz’gold, valued at £3,856, were wonin this Division during the year, which is an increase of 406 oz. on the retnrn for 1’9!. The Harry Smith Gold·mining Company is the princip:tl mine in the district, and last year it crushed 1,242 tons for 960 oz. The main shaft is now down 200 feet, and when in full work the company employs 30 men, Ooomc~ Division. Tile total value of gold from quartz and alluvial, won in this Division during 1895 was £5,1172, “as comparee] with £6,079 the previous year. The decrease is directly due to the extremely dry season, which completely paral ysed mining during the year in some parts of the district. At Cowra Creek many of the mines from which good results were expected were idle the greater part of the year, being unable to crush. Whitby’s battery, however, managed to crush 753~ tons for >Tarious miners, which yielded 478 oz. of gold. Lewis and Company also crushed 158 tons from the Victorian Gold Lease for 54 oz., and 47 tons from Brogan and party’s claim for 20~ oz. Bartlett and ‘William crushed 100 tons for 40 oz., and have 5S0 tons at grass awaiting water; and other miners have about 500 tons, which will be put through when watr.r is available. The Star of Uooma Gold.mining Oompany own some 33 acres of leased land, and has a good machine, site, and water, but is at present idle for want of capital. During the year thp, company crushed 900 loads for a yield of 336~ oz. of gold. John Murray has put in a tunnel on the north side of the Bredbo RiYer, for a distance of 204 feet, but lost the reef at about 150 feet. He is now trying to pick it up by cross· cutting. From another lease of his, known as the Democrat, he crushed 100 tons for 130 oz. This reef is about 15 inches wide, and appears to he a permanent and payable one. At Buckley’S Crossing a large number of men are mn,king a living on the river, owing to its lowness, arid a reef is also being prospected on prh’ate land in the locality. At Brown’s Camp a party are opening out a reef, and several men’ are doing well on the Little Plain River. The Nelbothery mine is idle, and so far as can be seen, there is little prospects of its being worked. At Colinton, the lease owned by the Colinton Gold·mining Company was sold for wages, and was bought up by the men, and aid from the Prospecting Vote being granted to them, they took out of this drive 42 tons, yielding 19 oz. of gold. They have now opened up a large block of backs, and good results are expected from their next crushing. Kiandm Divi.sion. There were 810 oz. of alluvial gola got in this Division during the year, valued at £3,006, which is a decrease of about £900 on the yield for 1894. The New Chum Hill tributors did nine months’ work for a return of 16 oz. of gold, and the mine is now for sale. The tunnels at the Twelve·mile have been steadily pushed on during the year, but without results, so far, although the prospects are considered good. John Robyns has put in his tunnel a distance of 400 feet, by means of aid from the Prospecting Vote. There suIt of his operations are closely watched, and in the event of them proving sllccessful, a large area of land will be eagerly taken up. Hooper and party, on Township Hill, anticipate striking the wash very sbortly and if their expectations are realised, a large field for mining under the basalt will he opened up. This party has received every assistance from the Prospecting Board. Moult and party, have struck a reef 4 feet 3 inches wide showing good gold. The shaft is now’ down 43 feet, but being an east and west reef some doubts are expressed as to its permanency. ‘Veselman. and party, close by, working a reef rnnning north and south, 5 tons from which crushed at the Adelong battery, went 2 oz, per ton. Several other quartz claims are working in the vicinity, and a battery is about to be erected. Fossickers still continue point of view, are brighter at present than they have been for some time. At Toolong, a number of miners still make a living, but the gold is very scattered, and uncertain as to quantities. At Grey Mares, Boogong-, a tunnel is being put in under aid from the Prospecting Vote to test a reef at a depth. The sluiciug claim in this locality continues to yield good wages. Prospecting operations are ·still being carried on at Bark Huts, but no discovery of any moment has yet been made. Nimitgbe?le Dil’ision. Very little gold is heing got in this Division, at the present time the principal work carried on being purely of a prospecting nature, from which little has resulted so far. .The lease taken up by Messrs Turbot and party, at Bunberra Creek, has virtually been abandoued, and will probably be reported for cancellation. The gold won during the year in the locality may be set down at at 50 oz. Captain’s Flat Division. The Lake George United Mining and Smelting Company saved in connection with their copper and silver mining operations 2,164 oz. of gold. Since the amalgamatiou of the two comFanies, i.e, The Lake George and the New Kohinoor, the number of hands employed has been greatly increased, and a secoud furnace has been put in blast. The company have hired one of the Government Diamond Drills to further prove the lode, and should their expectations be realised work will be found for a large number of extra men. The number employed at the present time is over 300. There were £1,368 worth of gold won in this Division during the year, as compared with £377 lOs. during 1894, which is highly satisfa~tory, eeeing the principal mining centres, viz., Bywong and Macs’ Reef, were cut off, and embraced in the new division of Bungendore. A good deal of alluvial mining has been carried on throughout this Division during the year by small parties of prospectors with very fair results, which would certainly have been better had the season been favourable and a good supply of water available. BUllgelldo1’e Divi8ioll. This new mining Division proclaimed during the year, returned 814 oz. of quartz gold, valued at £3,260. The rush to Bywong terminated somewhat suddenly, the dry season making work nearly impossible. Several of the claims still continue to put out good stone, the last crushings from Lowe’s and Cartwright’s claim going about 1 oz. pel’ ton. Johnston and McAllistir raised 700 tons for 200 oz. ; Giles, ‘Nilson, and party working the Energetic Claim, 62 tOllS for 114 oz. ; The Bywong Gold mining 1:lyndicate, 120 tons for 400 oz. ; and The Coolgardie Prospecting Claim, 113 tons for 50 oz. A large quantity of good·looking stone is at gruss, which will be treated immediately water for the purpose is available. There were 65 oz. of alluvial ancI 48 oz. of quartz gold won in this Division during the year. About the middle of the year a slight rush set in to Dairy Creek, situated 7 miles S.E. of Gundaroo Township, consequent upon the discovery of a gold.bearing vein on the property of Messrs. Batt, Rodd, and Purves. Several leases have been applied for, but so far little work has been done to pro\’e the value of the discovery. Subsequent to this discovery another gold.bearing vein was found on the gold reserve adjoining the above property. Although narrow and difficult to follow, it is rich, and has proved payable. A gold·bearing reef has also been struck on Hardwick’s land which has been reported payable. As prospecting work is being vigorously carried on in this Division some valuable discoveries are anticipated during the coming year. Alluvial mining in this Division is restricted to Brook’s Creek, where about twenty men are fossicking among the old workings. Prospecting was very active during part of the year rouud \Yagga \Vagga, but the results have not reached expectations. The deposits of stream·tin carrying a fair quantity of gold, to be found neal’ Pullitop, would, it is thought, prove payable were snfficient water available for sluicing purposes. There is a large area of payable ground in this locality, if the water difficulty could be overcome. SOUTIIERN MINING DISTRICT. Braidwood Divi8ion. There are 82 alluvial gold· miners working in this Division, including 12 Chinamen, who won among them 800 oz. of gold, valued at £3,080, which is 1:35 oz. less than the quantity won in 1894. Although a slight decrease is shown, the returns must be looked upon as satisfactory, in view of the fact that the year 1895 will long be remembered throughout the District as one of the most disastrous on record, both from an agricultural and mining point of view. The greatest portion of the small rainfall fell during th” early part of the year, consequently the crops were a failure and the carrying on of mining operations rendered nearly impossible. Four batteries were thrown idle from want of water, and many of the streams considered permanent are now dry. The most important work carried on in the District during the year was the cutting of the granite·bar at Snowball by The Enterprise Slnicing Syndicate, by means of aid from the Prospecting Vote, a work that has heen talked of by the local miners for the last thirty years. N othwithstanding that the operations of the Company have heen greatly curtailed by want of water for sluicing purposes, gold in sufficient quantities to pay actual working expenses has been got, which goes to prove that the venture will be a profitable one when rain does fall. The dimensions of the race are 4~ chains in length by 9 feet deep, through solid granite, it will serve to drain a large area 0 f auriferous country hitherto unworkable. Gold to the value of £11,577 was won in this Division, which is [1 little short of the yield eluring 189,1.. The eff~cts of the late drought were severely felt in this Division, and when rain sets in a large increase in the field may be looked for. A party at Bell’s Creek received aiel from the Prospecting Vote to further test their claims-and have been successful in striking very good·looking stone. Efforts are now being macIe to raise money to develop the discoveries. At the Bell’s Creek battery, 188 tons of stone were put throngh for a yield of 167 oz., and another 5’0 tons are ready to treat when water is available. Majm”8 (}ref7~ Divi8iol1. _ The returns show that the value of the gold won within this Division during the year, was £5,863, an increase of about £600 on the returns for the previolls year. \Vith few exceptions, no new discoveries have heen made during 1895 in this Division, the gold being won principally from old abandoned ground. During the dry weather when sluicing work was stopped a great many of the claim-holders on the olel workings were breaking down banks of earth into their ground. sluicers, which they expect will pay well when the wet season sets in. At Long Flat the puddling machines have been idle more than half the year, and great heaps of wash·dit·t are stacked, awaiting rain. Snobs Beef has been reopened and the present owners mean to gi\-e it a lair trial. During the year they raised 1,430 tons, which yielded 257 oz. free gold; and 525 oz. from pyrites, which were treated at Maryborough in Queensland. The shaft is now down 186 feet, and 24 men finn constant employment. So far only one party has taken advantage of the 33rd section of the Mining on Private Lands Act, 189,1. Many of the miners in this District complain of the 10 pC!’ cent. royalty and the lOs. per month license fee, which they state is exorbitant for ground that has been worked off and on for the past forty.four years. It is COll. fidently expected that some good quartz reefs will shortly be found in this locality. The extremely dry season had the effect of reducing the yield of gold in this Dil’ision from 2,260 oz. in 1894 to 1,669 oz. in 1895, the principal work being confined to mere fossicking in the vicinity of the river. Several quartz leaders were found hy some of the parties and followen to wa~er level, the crushings weighed in the aggregate 25 tons, from which 100 oz. of gold were got. This was, of course, picken ore, the lower grade stone being stacked for future treatment. A syndicate is said to be in course of formation to work the Day Dawn reef below water level 205 feet, at which point the water is unusually heavy, and requires powerful machinery to deal with it. The Homeward Bound and Scotch Lassie Leases stopped work at the lOO·foot level-the water beating them out. The yield from this Division was 700 oz. of alluvial a~d 90 oz. of quartz gold, a decrease of S57 oz. due to the scarcity of water for mining purposes, the men being driven from the table land to work in the bed of the Shoalhaven River. During the early part of the year a large number of men from Sydney started work on the banks of the river, but the short stay made by them would indicate tbat thcir expectations were not realised. A Sluicing Company has been formed to work certain alluvial claims at Colombo, and an English company has purchased the Beaula property, near Nerriga, whereon it pr6poses expending a sum of £30,000. Other companies on the river intend improving their water supply, and on the whole there is a marked improvement on the river in cOllllection with this class of mining. Nelligen Division. Mining matters were anything but brisk during the year in this Division, and only 190 oz. of quartz gold were won, the result of a crushing of 256 tons, onlyabont one-third the quantity won in 1894. The low average yield per ton may be accounted 101’ by the fact that Juring the year several new reefs were found and tried, some of them giving very small yields, although a lal’ge percentage went over 1 oz. per ton. Matters will probably liven up somewhat during the coming year, as 40 acres of leases were applied for during the last two months of lR95, principally at Clyde Mallow, where a battery is in course of erection. Brimbramalla is considered a good field, but is langishing for capital, the miners being mostly poor men. There are several good properties there, which, if amalgamated, should pay handsomely, and they have the advantage of an abundant supply of water. The crushing plant erected by the Phamix Company at Currowan has been removed, but Braithwaite and party are still doing fairly well by means of one stamper worked by hand. The same party are erecting a four·head battery, to be worked by horse-power, the tailings to be saved for special treatment. Another good property of 30 acres is being developed by White and party; but at present there is no battery in the vicinity to treat this stone. There is very little allu vial mining going on in this Division at the present time, and the quantity of gold got was only about 5 oz. from this source. Bateman’s Bay Division. This is a new division of the Southern Mining District, and was formed in consequence of the growing importance· of the mining operations being carried on on Big Hill, near Bateman’s Bay. The returns show that 90 oz. of alluvial, and 2U4 oz. of quartz gold were won during the year, giving a total value of £1,041. Fullerton and party have sold their claim to a company who have purchased several adjoining claims. with a view of floating them on the London market. Fitzgerald Bros., had one crushing of 33 tons for 87 oz. Several other parties are at work on the Hill, prospecting, with promising indications, some of them in receipt of aid from the Prospecting Vote. At Sandy Ureek, lying between Mogo ann. Bimbimhi, some good veins have recently been struck, and several parties are now at work in the locality. Coates and party had a trial crllshing of 10 ton& for 22 oz. of gold. Keating and party, at Bimbimbi, have erected two batteries, and have sold their claim for a good figure. Several other parties are at work, and are sanguine of striking something payable during the comiJlg year. Bateman’s Bay, formerly part of this Division, having been proclaimed a separate division under the Mining Act, has reduced the returns materially, the quantity of gold \von being 330 oz., yaluel at £1,195. At Turlinjah, Stathan and party have leased part of tbe Italia Mine, but little work has been done since the lease was taken up. They are raising a little quartz from the 50·foot level, their deepest level being 130 feet. Several quartz claims are at work, on Donkey Hill, near Moruya, and although the stone has to be carted a long way for treatment, the miners appear satisfied with the result. Cleaver and party are in receipt of aid from the Prospecting Vote to sink a IOO·foot shaft on their reef. About twenty men are fossicking among the old workings, but the scarcity of water has prevented them from earning more than a bare living. The retnrns from this Division show a satisfactory increase on the previous year, being 1,174 oz. valued at £5,127, the yiell in 1894 being 889 oz. valued at £3,600. In quartz mining very little work has been done, and only 170 tons were crushed at the local battery, which gave 122 oz. of gold. Cram and party during the year discovered a new vein on Captain’s Cl’eek and their trial crushing of 29! tons yielded 49~ oz. of gold. The Tin Pot Mine was abandoned during the last quarter of the year, but there is a probability of it being taken up again by an English company. There are several other quartz claims at work but they are only doing prospecting work. In alluvial mining about 160 men have been making a fair living during the year: A party of 20 chinamen on Cowdroy’s private land have won a considerable quantity of gold, but the exact amount could not be ascertained. There were 652 oz. of gold won in this Division during the year as compared with 1,119 oz. in 1894. During the year Bailey and Miles sold their mine to the Mount Dromedary Gold-mining Company (Limited), and the two mines are now being worked under the one managemf’nt. The returns from stone crushed during the year proved satisfactory, but the scarcity of water for the purpose retarded operations very much. The other mines on the mountain are in the same position-a large quantity of stone has been raised but cannot be treated for want of water. Considerable prospecting work’ has been done westerly from the old workings and several veins discovered, that give promise of yet becoming payable. A syndicate took up a 20·acre lease on old alluvial ground at Bermagui, on which they placed a patent gold.saving machine, but the result has not reached expectations. The Prospectors is the only claim at work on the Coolagalite Field, all the other.leases having been cancelled. Cobw’go Divi8ion. There is very little mining going on in this Division of any importance. There are still a few fossickers working the old alluvial ground who seem satistied with their returns. A party of three are sinking on a reef at Brassknocker, but hayc not been successful in striking anything payable so far. The principal scene of mining operations in this Division is known as the Nelson Diggings, situated 10 miles north from Bega. Work is carried on in the various creeks and gullies that take their rise in the Doct0r George Kange of mountains. The country is mostly composeJ of slate, though the range is of granite formation. A belt of basalt -crosses the creek at almost right angles immediately above where the gold is found and the general opinion of the more experienced of the men employed is that a lead of gold exists under the basalt. From one of the reefs outcropping in the locality 3 tons were raised from a depth of 30 feet, and on treatment at a Palllbula Battery yielded 17 dwt. per ton. Prospecting work is being vigorously proceeded with and occasionally specimens much richer than the quartz treated at Pamb111a are found. At the foot of the ranges and a mile nearer to Bega, alluvial mining has been carried on for many years past where the gold is found fairly coarse in sinking from 10 to 18 feet. It is thought that’a thorough prospecting of this Division would lead to im portant discoveries. The value of the gold won in this Division lui’ing the year was £27,534, more than double the “alne of that won in 1894. A decided revival set in during the ~ast few months of the year, on the Pambllia gold·field, owing to the important fresh developments in the Falkner’s mine. A great number of the cancelled leases haye been retaken up, and work started, which has resulted in new finds being made on those portions. The Falkner’s Gold·mining Company’s shaft is now lown 120 feet; but work has been carried on during the year, principally at the 90·foot level, and the quantity of stone raised was 2,051 tons, which yielded gold to the value of £21,546, the average number of men employed being sixteen. The Mount Gahan Golfl-mining Company employs eighteen men, and during the year raised 1,465 tons of stone, whieh returned. 466t oz. of gold, and from 1,740 tons of tailings the same company sayed by the cyanide process other 858t oz. of gold, valued in all at £4,289. This company’s shaft is 360 feet deep, at which level work is now being carried on. Th~ Mount Lewiss-on Gold.mining Company raised 45 tons, which yielded gold to the value of £560. The Great Victory Company, 17 tons for 119! oz., valued at £478 ; and the Hidden Treasure Company, 43 tons for 94~ oz., valued at £277. The Victory, the Diorite, and Great Southern Companies n,re still at work, but returns as to their yield during the year were’ not available. Gold.mining in the neighbourhood of ‘Wyndham, was, during the early part of the year all but abandoned. 24-D lease portion 6, and that their trial crushing of 14 tons had yielded nearly 45 oz. of gold. This caused a large number of miners to start prospecting work, and ground was pegged out in all directions. Several syndicates have taken up land in this locality, and are making arrangements to give the ground a thol’Ough trial. Messrs. R. Y. Medcalf and party, who hold 143 acres under miueral lease, have sent ~O tons of stone to Germany for special treatment, but the returns are not yet to hand. Robert Saddington and Co., of Sydney, have taken up several abaudoned leases, and are ereeting machinery to pump the water from the shafts. A few alluvial miners are at work about 15 miles north-east from Timbilica Postoffice, which is situatecl a few miles from the Victorian border. The deposits so far found have not proved to be of any extent, but it is thought that fresh ground will be struck on the ranges to the north-east of the prospectors’ claim. There are seventy-eight men, including thirteen Chinese, employed in gold-mining in this Division, and the result of their labour was 545 oz. of alluvial gold, valued at £2,071, which is an increase of a little over 100 oz. on the previous year. Quartz-mining in this Division is confined to prospecting, and several parties are receiving Government assistance to prosecute that work. The returns from this Division could not be obtained, although the quantity of gold won must have been considerable. The Caledonian mine continues to yield good gold, and the lease adjoining is reported to be very rich. By the end of the year all the batteries, with the exception of a small one at Clyde Mallow, had to shutdown through want of water. When the English companies formed to work the mines in this locality have completed their work for conserviug water large retnrns may be expected from this district. There were about 100 men prospecting throughout this Dh-ision during the year, but no payable finds were reported. The alluvial gronnd tried was proved to be not payable, and the quantity of gold found, if any, could not be ascertained. With the exception of the East Kangaloon Diamond-mining Company there is little mining work going on in this Division. The above-named company in connection with its diamonrl prospecting operations save a little gold. The company has erected a small steam puddling-machine, and constructed two small dams to conserve water. The hydraulic slnicing companies on the river, have, with one or two exceptions, ceased working priucipally through scarcity of water, bnt it is stated that an English company is making preparations to start work on a gravitation scheme for supplying water to work the deposits instead of pumping it. It is believed that by this means the extensive body of auriferous drifts on the river caJ. be profitably worked. The only mining being carried on iu this Division is on the Red Hill, about 14 miles from Yass, where several shafts have been snnk. A trial crushing of 6 tons was sent to Sydney for treatment, which was reported to have gone 6 oz. of gold per ton. Very little work has been done on the gronnd since, but it is the intention of the party to have another parcel of the stone tested in Sydney. Several claims have been pegged out in the vicinity of the prospectors’ claim, but little work will be done till the result of the further test of the stone is known. THE HUNTER AND MACLEAY MINING DISTRICT. Oopelctnd Division. The gold won in this Division dnring the year amounted to 454 oz., valued at £1,558, abont £1,000 worth less than the quantity won in 1894. This district has snffered severely from the dronght, and many of the batteries were unable to work. The Lady Belmore mine did not turn out so well as in past years; only on·e crushing of 70 tons was pnt through, which yielded 172 oz. of gold, a much poorer return than obtained from previons crushings. The party working the old Mountain Maid mine took out a small quantity of stone from the old stopes, which returned about 1~ oz. per ton. Carter, Fallon, and Seiman, who hold leases on the old Monntain Maid line of reef, are still driving their tunnel under aid from the Prospecting Vote, but have not yet struck the reef. The tributors of the Hidden Treasure took out a crnshing which did not turn out payable. The machinery on the mine is now unable to cope with the heavy influx of water into this mine. Chubb and party are still working on the Ceutennial reef, but it does not show any gold at present. At Bowmau mining is at a standstill owing to the scarcity of water, the batteries there being driven by water-wheels. At Cobark, Fitzgerald and party and Mitchell and party have raised small crushings, which have not paid wages. Anderson and party won about 3:! oz. from their sluicing claim, and about 80 oz. of allm’:ial gold were got by the fossickers working in the creeks and gullies. The returns from this Division have not come up to expectations, the total yield heing only 137 oz., as against 205 oz. won during 1894. Several claims at Monkerai have stopped work owing chiefly to the want of capital. About the end of the year 20 acres of Church and School lands on Lawler’s Creek were pegged out, where splendid sm·face shows can be obtained. The prospectors are sanguine that they will strike something payable. The claim at Cherry Tree JIill, near Dungog, has been idle during the year. The quartz-claims at \Yhispering Gnlly, above Upper iYangat, are deserted, and the miners have tnrned their attention to the allnvial ground in the valley with good results, some beantiful nuggets being unearthed at iYangat. Four claims have had fair returns from their crushings, viz., the Brandon, Monntaineer, vVelcome Stranger, and Wonga \Yonga. Garduer and party at Redbank, near Lower \Yangat, are steadily pushing in their tunnel, which is now in 171 feet. They are in receipt of aid from the Prospecting \T ote. ](empsey Division. As far as could be ascertained only a few onnces of gold were won in this Didsion during the year. The Deep Creek gold lease was not worked. Some years ago this mine was purchased by Messrs. Cochrane and Gearey, and some difficnlty arose which prevented the leases being transferred to their names. When this has been done it is the iutention of the purchasers to fully develop the mine, which, if proved payable, would be of great benefit to the district. The plant Bnd chlorination works on the mine are valued at £14,000. There are about forty-five men prospecting in this Division, principally at Twill Creek, situated about 60 miles from Taree, and it is stated that they are earning fair wages, although no information as to the quantity of gold won could be got. About twenty-five men are employed at Cells Creek, where some good stone is being obtained, which is crushed by a battery worked by water-power. PEEL AND URALLA MIXING DISTRICT.